An emotionally pummeling drug-addiction drama cements Timothée Chalamet as the real deal. Timothée Chalamet, all of 22 years old and indelible as two radically different kind of boyfriends in last year’s ‘Call Me by Your Name’ and ‘Lady Bird’, is doing major things in his new movie, ‘Beautiful Boy’ – things that no other actor of his generation is attempting. You have to go back to Marlon Brando to see these kind of heartbreaking frowns, the angelic face turned upward, wrestling with frustration. Chalamet is playing a college-bound kid derailed by drugs: meth, pills, everything. What he’s pulling off in a diner with Steve Carell (as the panicky out-of-his-depths dad) – a combination of cajoling, breaking down, acting fake-tough – is incredibly tricky. Even subtler are Chalamet’s wordless moments: a slack-jawed, Christian Bale-like zombie walk through a campus quad; a sober drive up the sunny California coast, Neil Young’s ‘Heart of Gold’ on the stereo, the dissatisfaction slowly creeping in. How much easier it would be to focus on Chalamet, doing the most overwhelming work of his young career, and not the earnest, seesawing movie around him. ‘Beautiful Boy’ is perfectly fine: unflinching where it needs to be, keenly attuned to the cyclical nature of relapsing along with the deeper blows to pride, trust and identity. It sometimes feels strenuous in making its points, but you’ll be too wrecked to call that a flaw. The script, loaded with sharp details, comes from the dual father-son memoirs of David and Nic Sheff; director Felix Van Groeningen gets out of the way of his performances and uncovers a rawness that elevates this above a telly drama. Parents will feel heard by this movie in a way that few other films have tried. Everyone else should go for Chalamet, who’s a rocket taking off. You want to be able to say you were there when it happened. Good but not perfect and worth watching but not unmissable, this harrowing tale of a drug addict and his family dealing with addiction delivers a straight talking message and excellent performances from Steve Carell, Timothee Chalamet and Maura Tierney. Incredibly bleak to watch, it's relentless & unforgiving in a similar sort of way as 'Requiem for a Dream' which means that while I can fully appreciate the story & the courage that went into writing it from both David and Nic Sheff's memoirs, I probably won't ever want to watch it again. It's interesting that 'drugs' films either go down this rabbit-hole of despair or they pair the seriousness of the situation with some uncomfortable levity a la 'Trainspotting', a film I have watched several times. 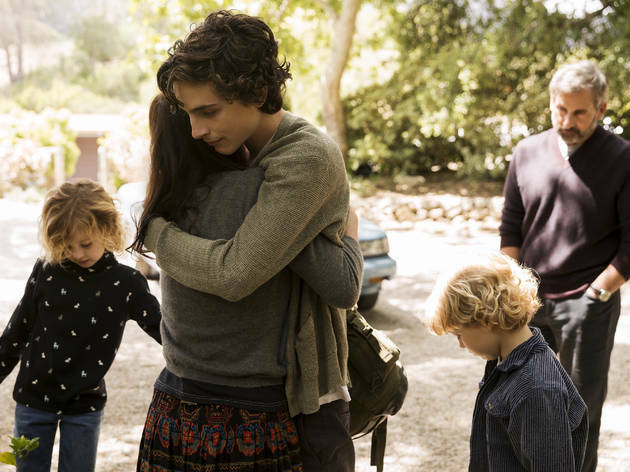 Neither style glamourise it, they just approach it in a very different way and from very different protagonist perspectives; 'Beautiful Boy' is very much from the father's point of view and your heart aches for Carell as the dad who did everything he was supposed to and for Chalamet as the son who had every opportunity a young man could have, yet squandered it all with an inexplicable need to hurt himself and those around him. It's that inability to answer the question of 'why' that probably stands as the most frightening message for any parent watching. Does it show you that drugs are bad? It does; there are a couple of scenes that are quite shocking to watch which I felt there absolutely needed to be for it to be taken seriously. Does it show you how ripped apart families can be and how sometimes, those wounds can't be healed? It does, with Maura Tierney's step-mum the one saying what needed to be said at key points much to the relief of the audience. It's a long hard watch and as a huge fan of Carell's, I was glad to do so - honestly, he just gets better & better - but it wouldn't have felt beyond the realms of possibility to find this movie at 9pm on Channel 5 one Saturday night instead of on the big screen with an A-list cast. This is a film that needed to be made; the possibility of your teenage child being introduced to drugs and the subsequent possible addiction must be thoughts that go through many parents' minds at some point. The ensuing agony and desolation is something we cannot imagine. The family is ripped apart. The lying. The stealing.Words said that cannot be unsaid. The physical and mental consequences.And all of these angles and aspects are superbly portrayed by Timothee Chalamet (still only twenty three and two years younger when filming took place). Taken from books written by both father (Dave Sheff) and his son (Nic Sheff) about exactly such a horror, this film shows us the true picture. There is nothing fun about becoming an addict. There is no glamour in the world of drugs. Steve Carell is rather like a fine wine, improving with age.There is a clever balance between his caring, honest 'father' and Chalamet's drug-addled son. What a performance from Chalamet. Oscar worthy? I hope so. The tale of a father trying to deal with his son's drug problem. Very good performances from Steve Carell & especially Timothee Chalamet. Basically the message from the film is that drug addiction is very difficult to deal with & it can destroy lives. This is another "based on" true story & it's very well made & an opportunity for the audience to share a lot of misery with a very privileged family. I just wish I could get more out of the experience. I would like to think that there is an audience out there who are unaware of the seriousness of the issue and will to get the message. Maybe I'm just being naive searching for any sort of "message".